Adrafinil is a nootropic stimulant compound that promotes wakefulness and alertness, which is why it has been used to improve symptoms of narcolepsy. There is some possibility that Adrafinil could also help to improve memory and depression, but more research is needed on these fronts. People who buy Adrafinil report increased energy and a boost in focus. The typical dosage of Adrafinil is between 150-300mg of the supplement a day. Given the potency of the nootropic it’s smart to start with a low dose so your body has a change to adjust to the dosage. You should take Adrafinil on an empty stomach and avoid taking it late in the day because of the wakefulness properties. Taking it too late could make it difficult for you to sleep at night. You should also cycle Adrafinil; such as by taking it for two weeks and then taking a week off. This is because it can damage your liver. Athletes are warned that the supplement is banned as a nonspecific stimulant compound by the World Anti-Doping Agency. Wakefulness – Adrafinil was created primarily to be used as a wakefulness-promoting supplement, meaning that it keeps you awake and boosts energy levels. If you have some kind of sleep disorder such as sleep apnea or you work shifts then you’re usually tired during the day. You’re unable to get anything done and it can lead to a whole host of problems including weight gain and low mood. Adrafinil perks you up and can boost your focus, mental clarity, and retention. As such it’s commonly used by students to make it through difficult periods and enhance learning. Wellbeing – Adrafinil gives you all the mental and physical energy you need to get through the day, but it doesn’t cause the same kind of hyperactivity and jitters that you will get with other stimulants such as coffee. As such you’ll find that it improves your overall sense of wellbeing. It reduces stress and makes you happier. Part of this could be because it stimulates your dopamine receptors. Either way Adrafinil is one of the best ways to start your day. Cognitive Benefits – Adrafinil is much more than just a stimulant. As a nootropic, even a synthetic one, it displays nootropic benefits such as increasing your learning capacity and memory, including memory recall. People who take Adrafinil have noted that they find it easier to focus and concentrate on their work, have better mental clarity, and makes it easier for them to do mentally-fatiguing tasks for longer periods of time. While Adrafinil is quite effective by itself it is possible to stack it. 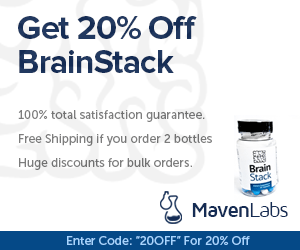 It works best when stacked with other nootropic supplements such as Noopept and Piracetam. The most popular Adrafinil stack is combing it with noopept, which is a great combination for when you need focus and attention to get you through mental work. This stack involves taking 10mg of noopept with a 150mg dose of Adrafinil no more than twice a day. Nootropics Club have researched trusted stores online and can give you the advice you need. Nootropics Depot and Double Wood Supplements are stores we trust and can recommend to you. You will be able to find Nootropic supplements here at a good price. Happy Shopping!